MainAll NewsForeign AffairsIMF Calls for Funding of Fatah-Hamas Unity Govt. IMF Calls for Funding of Fatah-Hamas Unity Govt. International Monetary Fund urges international donors to step up funding to fill 'sizable gap,' even as rocket wave crashes on Israel. The International Monetary Fund (IMF) on Thursday urged international donors to increase funding for the Palestinian Authority (PA) to aid "Palestinian reform efforts," indicating the new Fatah-Hamas unity government. IMF mission chief Christoph Duenwald said the PA is "doing a commendable job" of managing its economy, but that the global donor community needs to fill a "sizable" gap in funds for the PA, reports AFP. It is worth noting that as of March, the PA had reached a staggering $4.8 billion in debt. "Against the background of rising political uncertainty, the economy of the West Bank and Gaza is weakening," said Duenwald. "Unemployment, particularly youth unemployment, currently at 43%, continues to rise from already high levels." In his call for funding, Duenwald said "continued donor support is vital at this time, as is a comprehensive easing of Israeli restrictions to underpin the Palestinian reform efforts." While Israel has limited access to Gaza due to attacks emanating from the terrorist organization Hamas's stronghold, the area is in fact under an Egyptian siege which is primarily to blame for its financial situation. 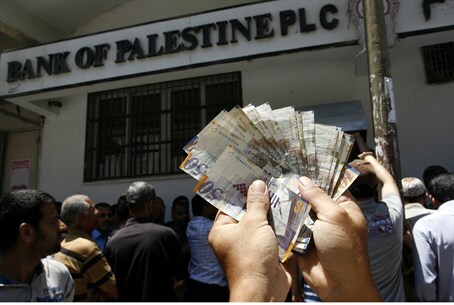 Another factor in the financial mire of Hamas is a wage war with the PA; Hamas's 40,000 employees are not being paid backlogged wages by the newly established unity government, even while the PA's 70,000 employees in Gaza continue to be paid. While a financial bail-out from Qatar temporarily stemmed the crisis, chances of pay for the next month remains unlikely, and unity government Prime Minister Rami Hamdallah admitted in an interview two weeks ago that his government is powerless in Gaza and has no plans to defuse the situation. The IMF call for funding comes the same Thursday that terrorists in Gaza further escalated their rain of rocket terror on southern Israel, with the total since Wednesday already well over 40 rockets. There has been wide criticism that international funding to the PA goes directly to funding terror, given its generous bankrolling of convicted terrorists. PA officials have revealed the organization is using deceit to dupe donors and continue funding terror.